Win a 55-gallon rain barrel by using your artistic talent! The Centerville-Washington Park District has a rain barrel to install at the Activity Center Park headquarters building. In addition to the environmental benefits, we’d like to use it to display your artwork in this high traffic park! 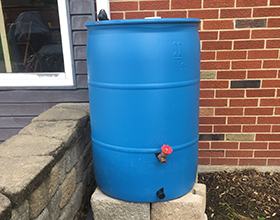 Rain barrels are above ground storage containers designed to capture rainwater for reuse. They reduce the rainwater runoff that is polluting our waterways with fertilizers and pesticides. Placing a rain barrel under your gutter’s downspout lets you collect the runoff from your roof. From a spigot near the bottom of the barrel, you can hook up a garden hose, open the valve, and use the water for a wide variety of applications. Many homeowners rely on harvested rainwater to water their lawns, nourish their plants and gardens and to wash their cars! This steady supply of free water may even help you save money on your water bill. Rain barrels save the average homeowner about 1,300 gallons of water during peak summer months! Submit your rain barrel design proposal to CWPD’s Communication Coordinator, Carrie Dittman, at cdittman@cwpd.org by July 1 for consideration. Include your full name, mailing address, phone number and age with your design. If your design is chosen, you will get to paint the design on our rain barrel and you’ll get a free rain barrel of your own ($55 value). Please contact Carrie with any questions!